Call or e-mail for any unanswered questions. Do you buy or sell resin or excess plastic? We purchase HDPE scrap, pellets, purchings, dust, shavings and parts. We periodically sell some excess pelletized Santoprene, HDPE and comingled-baled scrap TPU and ABS car bumpers. What does Greystone Logistics manufacture? 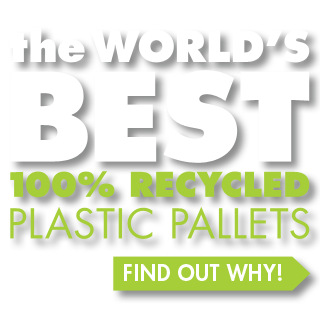 Greystone is the largest 100% recycled plastic pallet manufacturer in the United States. What size pallets does Greystone make? Do you have inventory in stock? Greystone maintains some inventory for immediate shipment. Prices are quoted FOB Bettendorf, Iowa and are based on quantities ordered. A convenient way to get a quote is available on this web site. Greystone provides a residual (trade-in) credit for all pallets sold and buys other old plastic pallet scrap to help our customers. Can I rent or lease rather than buy? Yes. Please contact Warren Kruger or Marilyn Carter. Why are plastic pallets better than wood? Will the pallets work in a -15 degree environment? Greystone can use an additive to allow use at these extreme temperatures. Are the pallets fire retardant? Greystone pallets ignite at a higher temperature than wood. Fire retardant additives can be added which increases the cost. Have the pallets been laboratory tested? In general, USDA does not “approve” materials, equipment, chemicals /coatings, etc. for use in meat and poultry establishments. The use of such equipment/materials is subject to the Sanitation Performance Standards, found in 9 CFR 416.1 – 416.5. In particular, 416.4(c) requires that chemicals used by the establishment must be safe and effective under the conditions of use. Also, 416.3(a)(2) requires that equipment and utensils used for processing or otherwise handling edible product or ingredients must be of such material and construction to facilitate thorough cleaning and to ensure that their use will not cause the adulteration of product during processing, handling or storage. In other words, establishments that use any equipment or other technology in the food production or storage areas of the establishment should be able to demonstrate that this substance will not result in adulteration of products or insanitary conditions. FSIS Directive 7640.1 Amend. 1 addresses the previous function of the USDA approving equipment for use in a processing and/or slaughter environment.